Winter is nearly here. This ski season, you might be considering purchasing your own snowboard for the first time or upgrading to prepare for another winter. Here is a simple guide to what you should be on the lookout for as well as the right terms to use when shopping around. There are roughly three basic lengths when it comes to snowboards: short, medium and long. Pretty simple, right? Short boards are easier to ride and are able to make sharper, quicker turns. This works out well for both beginners and trick riders who need more control of their boards. For beginning snowboarders, a short board that comes to about their collarbone or chin when stood up vertically is preferred because it will turn easily and be less cumbersome. For boarders who want to jump in the park or half pipe, a short board is preferable as it gives them the ability to make speedy, clean maneuvers. Medium-length snowboards are designed to fill in the gap for an intermediate or more advanced rider that wants to be able to enjoy a variety of terrains in both the park and on the slope. These boards usually measure up to the chin or nose of their rider. Finally, long snow boards which stretch from eye-level to even a few inches past the top of the rider’s head are designed for high-speeds and quick carving in deep snow. These boards are usually favored by big mountain boarders who have a need for speed and wider turns. Although snowboards are typically measured by a person’s height, the rider’s weight is perhaps even more important. When purchasing a board, it is important to follow the manufacturer’s guidelines for recommended weight. This way your board will be the most effective for you. It will perform better at fast speeds and quick turns. A light rider will have a trickier time turning a long board, and a heavier snowboarder won’t be able to get as much performance out of a board which is too short. Both height and weight are factors that get added to a rider’s personal style preferences. In addition to varying lengths, there are numerous types to choose from. 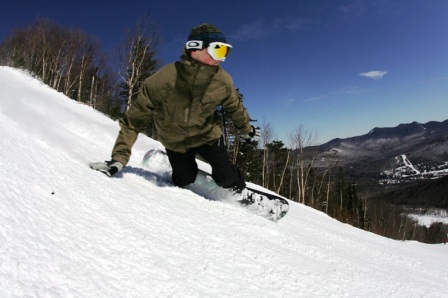 The most common is the all-mountain board which works for both the slope and the park. It is also called the freeride. Next is the freestyle or park snowboard which is a light and flexible board with twin tips for switch riding in either direction. Other boards come in extra-wide versions for large footed snowboarders to provide added leverage. Splitboards are an awesome combination of ski and snowboard. Designed for backcountry touring, a split board offers the option to detach your snowboard into two skis at any point. Like any sport, there is an entire vernacular which has developed to help snowboarders communicate about their passion. Here is a list of a few basic terms about the shape of the board and what the lingo means. Camber—this can refer generally to bend of the board, but can also be used to mean a convex board. The camber describes how the board meets the feet at the rider’s contact points, explains Transworld Snowboarding. Rocker—describes when the board is concave, dipping down in the center. Flat—this one is pretty simple. It means a flat board that is straight with no arch in the center. Cambered medley—this is the fourth style of camber which almost looks like a pair of eyebrows when you focus on the edge of the board. This style is convex near the two ends and concave in the middle. Finding the right snowboard is a fun process to work through. It involves some research and testing out to determine what capabilities suit your style best. With these factors in mind, you’re well on your way to finding the perfect board for next season. This entry was posted in Featured, Snowboarding, Winter Sports and tagged Snowboarding, Snowboards. Bookmark the permalink.